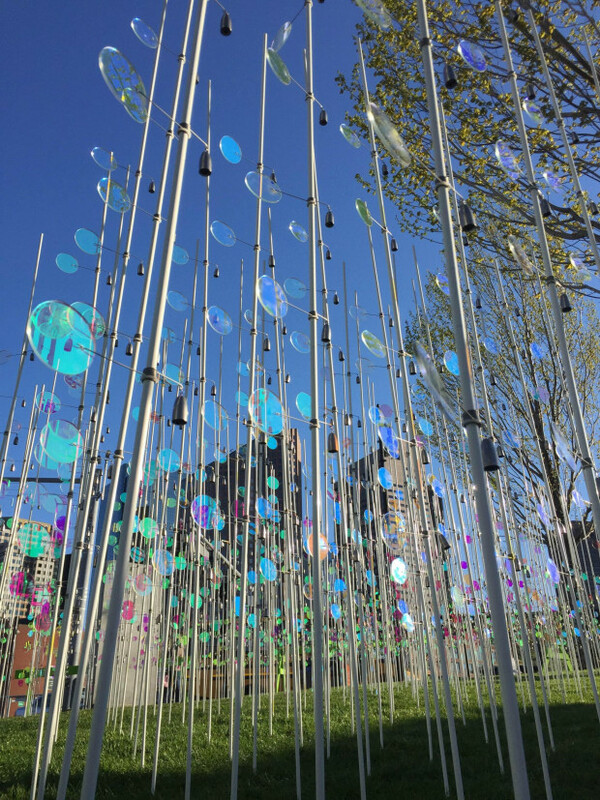 High Tide is a site-specific, kinetic, temporary art installation on the RFK Greenway in Boston, MA. The installation is located on a 4700 SF site between the historic North End neighborhood and the park system. 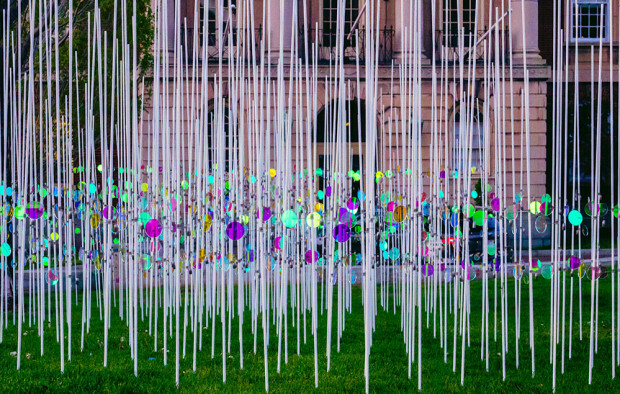 Designed to evoke a marsh inundated by water, the installation consists of 500 fiberglass rods and 1600 dichroic plexiglass circles. The latter spin in the direction of the predominant wind, reflecting and transmitting different colored light. High Tide seeks to connect the public to Boston’s ever-changing tidal landscape, its history of man-made land reclamation, and its future potential flooding due to sea level rise. 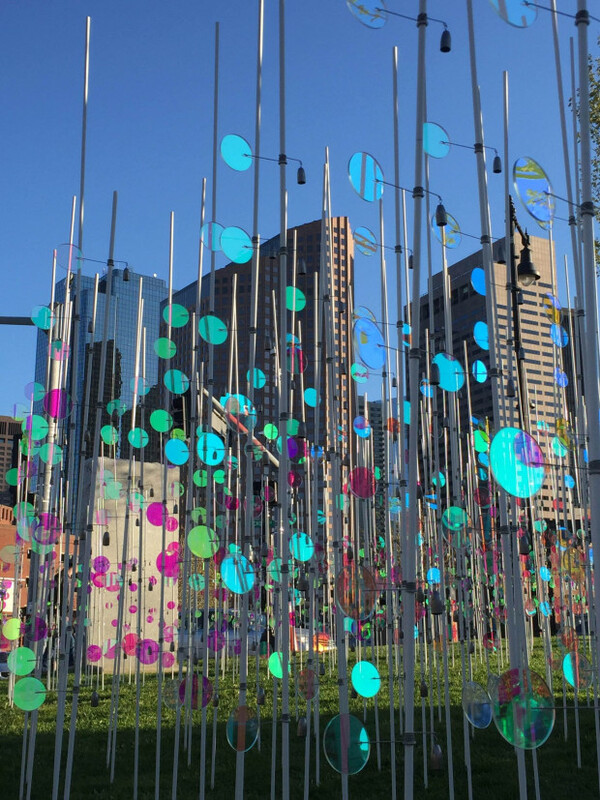 The design for High Tide responds to two main goals: to create a site-specific installation that would connect the park and its local communities; and to create a strong gateway to the park system. In order to achieve these goals, the artist sought to create a highly visual and dynamic marsh sculpture to make a strong connection between the site, its users, and the larger local landscape. This connection is experienced at multiple levels ranging from the visceral to the intellectual. 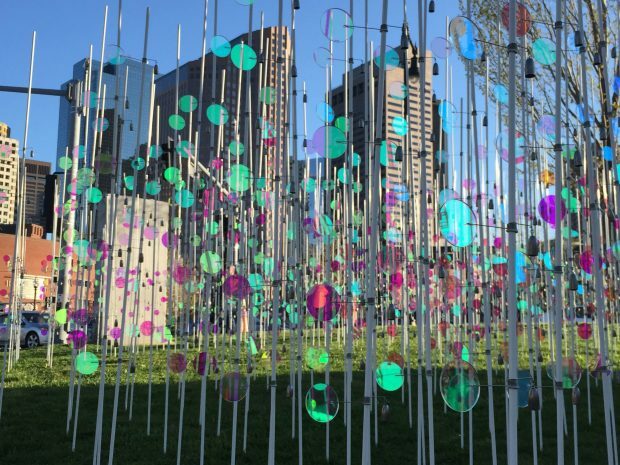 The installation creates a strong visual impression with its moving colored light coming from the dichroic acrylic circles, representing the volume of water during flooding. This volume is shaped by the site’s sloping terrain: it is shallower along the higher elevation near the park, and deeper along the lower elevation next to the North End neighborhood. The marsh serves as a tool for visualizing an imaginary flood line, inviting the public to reflect on Boston’s historical and future shoreline. High Tide transformed an empty lawn into an engaging art space that acts as a physical, emotional, and intellectual gateway into the park, the local communities and the larger local landscape. High Tide is the result of a successful collaborative process between the artist, the client, the engineer, the installer, and college students. The artist acted as the main hub engaging professionals and students in pushing the boundaries for innovative design, performance, and maintenance for this art installation. Notable collaborations include working with an engineer in the design of custom metal connectors that would allow the circles to spin around a rod; working with a local landscape design-build firm to install the rods without affecting an existing irrigation system; and most importantly, working with the client, The Rose Kennedy Conservancy, in finalizing the design, installation and maintenance of the art piece. The result of this collaboration was the decision to allow the grass to grow naturally through the rods in order to respect the organic horticultural practices of the park and eliminate the harm and waste resulting from removing a section lawn and using a groundcover. The grasses will be allowed to grow during the time of the installation, creating a natural meadow. Finally, the artist was able to collaboratively engage her students in the fabrication, installation, and documentation of the piece. High Tide is a hand-made piece. 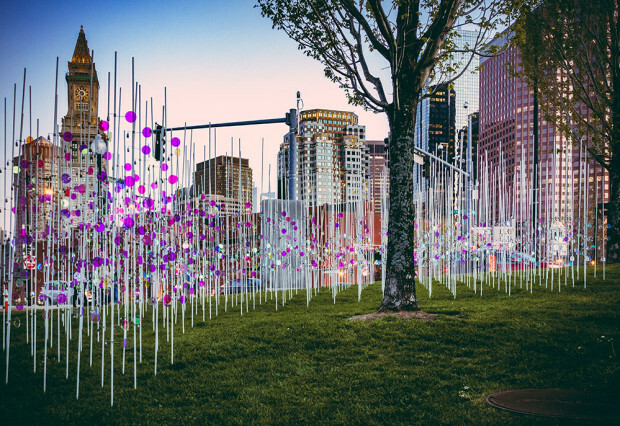 Although the parts were designed and manufactured using laser-cutters and other high-tech manufacturing processes, the artist and her students in the Landscape Architecture and Regional Planning department at the University Massachusetts Amherst assembled the pieces by hand. The installation on site was also done by hand using very simple tools.